Miami, Fla. – Founders Desmond Child and Rudy Pérez on behalf of the Board of Directors and Officers of the Latin Songwriters Hall of Fame (LSHOF) proudly announce the names of the songwriters and composers to be welcomed this year into the esteemed hall. 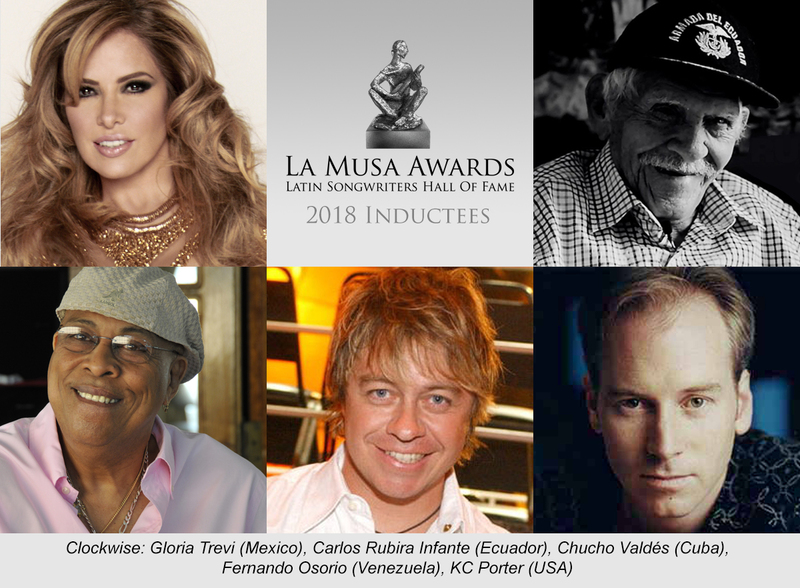 The final top five elected songwriters will be officially inducted at the 6th annual LA MUSA AWARDS ceremony and gala which will take place on October18th, 2018 at the James L. Knight Center in Miami and directed by Richard Jay-Alexander. The confirmed Inductees will be take part in the LA MUSA AWARDS induction ceremony and receive their awards in-person. The voting period ended Sunday, April 15, 2018 at midnight with thousands of votes from all around the world. To be eligible for induction into the Latin Songwriters Hall of Fame the songwriter, composer or lyricist must have had their first published work released at least 20 years prior to the year of induction. All inductees are presented with the silver La Musa trophy statuette and honorees with the bronze Musas created by world-renowned sculptor Alan LeQuire. Singer/songwriter, and philanthropist, Trevi is one of the biggest names in Latin entertainment. With over 30 million albums sold, her career is the type of success story that films are made of. Distinguished by her rich, fiery vocals and emotionally resonant lyrics, Trevi has released 13 albums and penned over 400 songs, including many that have made her the voice of her generation. Among her biggest hits are “Dr. Psiquiatra,” “Mañana,” “Pelo Suelto,” “Tu Angel de la Guarda,” “Zapatos Viejos,” “Con Los Ojos Cerrados,” “Una Papa Sin Catsup,” “El Recuento de los Daños,” “Todos Me Miran,” “Cinco Minutos,” “Psicofonia,” “Vestida De Azucar,” “El Favor De La Soledad,” “Habla Blah Blah”, and “No Querias Lastimarme.” Her most recent release, “El Amor” has already gone platinum, reached number one on the Billboard Latin charts, and boasts two number one singles, “Como Yo Te Amo” and “Las Pequeñas Cosas.” Trevi has placed an incredible 10 albums on the Top 10 Pop Latin Albums chart. Numerous awards are part of her career, including last year Female Artist of the Year by Latin Music Awards. For the past three consecutive years, reported by Pollstar and Billboard, Gloria has ranked #1 worldwide top box office Mexican Female Artist. Winner of six GRAMMY® and three Latin GRAMMY® Awards, the Cuban pianist, composer and arranger Chucho Valdés is the most influential figure in modern Afro-Cuban jazz. A protean performer, as comfortable in small groups as leading large ensembles, his most recent projects include Trance, a two-piano duo project with fellow Cuban virtuoso Gonzalo Rubalcaba and, before that, an extensive tour, celebrating 40 years of his founding of Irakere, a band that, with its bold fusion of Afro-Cuban ritual music, popular Afro-Cuban music styles, jazz and rock, marked a before and after in Latin jazz. Born September 16, 1921 is an Ecuadorian singer and songwriter of pasillo and pasacalle music. He began performing his songs on the radio station El Telégrafo for a program called “La hora agrícola”. He then formed the group “Vera Santos-Rubira”. Rubira was awarded the National Prize in Art “Premio Eugenio Espejo” in 2008 from the President of Ecuador. He has written over 400 songs. Fernando Osorio is a singer-songwriter, born in Bogotá, Colombia, and raised in Caracas, Venezuela. In 1982, while being a member of the choir of his church, met Juan Carlos Perez and formed the duo Fernando y Juan Carlos. Osorio has had combined a parallel career as a songwriter. As a writer, his first success overseas came with “Sólo Con Un Beso” recorded by Montaner in 1988. The song peaked at number seven in the Billboard Hot Latin Songs (formerly Hot Latin Tracks) in the United States. Osorio also composed “Ojos Negros” and “Vamos a Dejarlo” for Montaner’s debut album. In 1996, he wrote “Lloraré” for Jerry Rivera’s album Fresco, reaching number-one on the Latin Tropical Airplay chart. Cristian Castro also covered “Lloraré” and included those songs on the Grammy Award nominated album Lo Mejor de Mí. Osorio also wrote “Moja Mi Corazón” with Andrés Levin, the first single of Azabache, a 1997 studio album released by Spanish singer Marta Sánchez. The track became a Top 20 hit in the United States Latin charts and number-one on the Latin Pop Airplay chart. The same year, Osorio signed a recording contract with WEA Latina and wrote 40 songs for his first album under this contract. Osorio also composed the last track recorded by Celia Cruz before her death: “Rie y Llora” (“Laugh and Cry”); the song reached number-one on the Latin Tropical Airplay and earned Osorio a Latin Grammy in 2004 for Best Tropical Song. Born June 27, 1962 is an American record producer, songwriter, musician and singer. For over three decades in the entertainment industry, Porter has earned numerous Grammy nominations and 3 Grammys and Latin Grammys. He is best known for his production work on Carlos Santana’s Supernatural, (which sold over 27 million copies worldwide and won 9 Grammy Awards) and for producing and penning some of the most popular Spanish language singles for Ricky Martin to date.He is also known for crossing over artists such as Bon Jovi, Janet Jackson, Brian McKnight, Toni Braxton, Scorpions, Mýa into the Spanish speaking market and crossing over world music artists such as Laura Pausini, Khaled, Kadim Al Sahir, and Cheng Lin into the international market.